Newborn rescued from stormwater drain - SABC News - Breaking news, special reports, world, business, sport coverage of all South African current events. Africa's news leader. Dozens of residents from the area cheered as they saw the baby emerge from the drain alive. After a two hour long rescue operation, a newborn baby girl has been rescued from a storm water drain in Newlands East, Durban. The baby is alive and currently receiving medical attention. She was removed from the storm water drain on a residential property. The infant, who came out trembling, was safely rescued by paramedics from Kwazulu-Natal Emergency Medical Services, the Fire Department and Rescue Care paramedics. Dozens of residents from the area gathered to see the rescue unfold and cheered as they saw the baby emerge from the drain alive. Rescue Care spokesperson Garrith Jamieson says members of the public were walking pass the drain when they heard the cries of the infant. Jamieson says, at this stage it is unclear how the baby ended up in the drain. Durban paramedics have praised the rescue efforts of emergency teams and community members who responded swiftly to the infants cries. 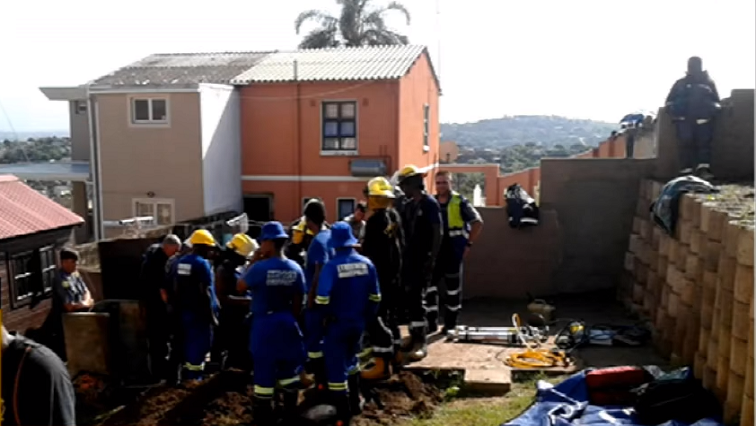 KwaZulu-Natal Emergency Medical Services spokesperson Robert McKenzie says the baby had been washed several metres down the pipe when teams found her. But McKenzie says she has been rushed to hospital in a stable condition. This entry was posted on 11 Feb 2019,11:34AM at 11:34 AM and is filed under South Africa, Homepage Featured Story Slider. You can follow any responses to this entry through the RSS 2.0 feed. Both comments and pings are currently closed.